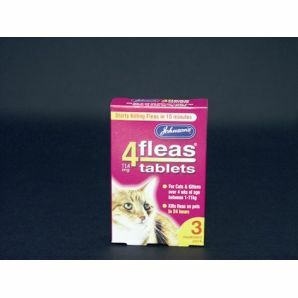 4fleas Tablets for Cats & Kittens. (available in 3 and 6 Treatment Pack). For use with Cats & kittens over 4 weeks of age between 1 & 11kg. Starts killing fleas in 15 minutes. Kills all fleas on pets in 24 hours.